I love white teeth. I would love to have tan skin and white teeth all year, and although I know I can’t sport the tan healthily all year, I can have the best, whitest teeth possible by using the best teeth whitening strips on the market. 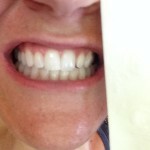 Laugh if you must, but my dentist even marvels at how white my teeth are! Here’s a photo of my teeth next to a white piece of paper so you can see just how white I am able to keep them with the help of whitening strips! My teeth aren’t perfect but they sure are white! The trick isn’t to go so crazy with whitening strips that your teeth are super sensitive all the time (how to stop teeth sensitivity), but rather to whiten them, and keep them white with a great everyday toothpaste like the Crest Whitening with Scope toothpaste (yes, that’s what I use). I use the best Crest Whitening strips on the market each time I buy them. 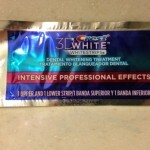 Currently I think this is the Intensive Professional Effects Crest White Strips. They are not cheap but I only have to buy them about once a year, so it’s not so bad cost-wise. I don’t use them everyday for a period of time because I’m a wimp and hate tooth sensitivity. I only use them about every other month or every third mont h. But I only use them one time. Yes, one time. Not morning and night, just once. 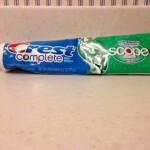 I’ve found a great sensitive toothpaste, but I would prefer to not have sensitive teeth at all! If you’ve never used them before, you may want to use them more than I do in the beginning to get your teeth as white as you can (follow package instructions), and then switch over to my plan.